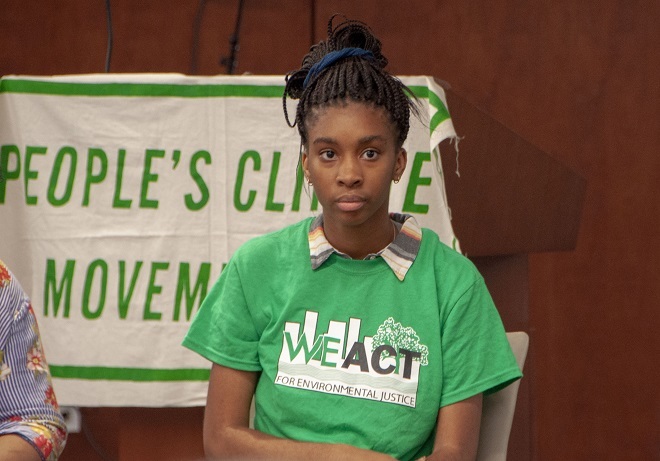 WE ACT Intern Langa Sibanda gave an inspirational speech at the planning meeting for the 2018 People’s Climate Movement New York march for climate, jobs, and justice. Good evening everyone. My name is Langa Sibanda, I am seventeen years old, and I am here with WE ACT for Environmental Justice. I attend the Beacon School in Hell’s Kitchen, but I reside in West Harlem. Tonight, I am here to briefly discuss why it is important for me, you, and everyone you know to fight for climate action now. The hard yet inescapable truth is that the leadership of our country has and continues to significantly contribute to the prosperity of an extractive economy that jeopardizes and violates our ecosystems in order to attain its ultimate goal: the accumulation and preservation of the wealth and power by the top 1%. People across the age spectrum find themselves in dehumanizing labor conditions in response to the high demand for materials. Efforts to reduce pollution and create greener spaces in low-income neighborhoods are made to attract the wealthy and kick the original residents out. Air pollution produced by the largest buildings in the city has caused an increase in children asthma rates. Both the construction of industrial buildings and the increasing rates of waste heat contribute to the transformation of our city into an urban heat island, which makes us, the residents, susceptible to its damaging effects. Facilities that secrete toxic waste into our air and water are usually placed in locations that are densely populated with people of color. In this way, communities of color are hit first by the destructive effects of climate change and pollution. We should in no way accept any of this as the norm. We have to do something to stop this. We have to take action. Climate action cannot possibly exist while an extractive economy continues to flourish, which is why it is our responsibility to develop a new economy: a regenerative economy. A regenerative economy does not rely on labor driven by exploitation and utilizing natural resources to a nonrenewable point. In fact, it works to achieve social and ecological well-being for all. The destruction of the extractive economy and the formulation of the regenerative economy in its place is not something that will happen overnight. It will take the efforts of us all to ensure a just transition from a toxic and oppressive system to a productive and restorative one. That being said, it would be absolutely irresponsible, immoral, and unjust of us to once again leave low-income communities of color in the dust as our plan progresses. It would make us no better than the oppressive powers we are putting in all this energy to defeat. We have to make sure that in restoring our ecosystems, we are providing individuals that may not possess high school or college diplomas with jobs with fair wages and fair conditions. In this way, we are not only contributing to the rehabilitation of the environment, but we are also decreasing unemployment and successfully lifting up our communities. We need to advocate for the ecological and economical justice for all communities, especially those that have fallen victim to environmental and systematic racism. To change everything, we need everyone, and the March for Climate, Jobs and Justice is the perfect opportunity for us to call on New York State Governor Andrew Cuomo and New York City Mayor Bill de Blasio to guarantee a just transition to 100% renewable energy, a permanent stop on all fossil fuel infrastructure, and a payment from corporate polluters for their damaging effects on our city. Our ability to come together as a community will determine how successful our efforts are. Tell everyone you know, everyone you meet, and everyone you speak to come support the movement on September 6. Every effort counts. There is strength in numbers, and it is going to take several communities – all races, all genders, all classes, all boroughs – banding together to disrupt the cycle of the extractive economy for good.